So, you think you don’t like kale? 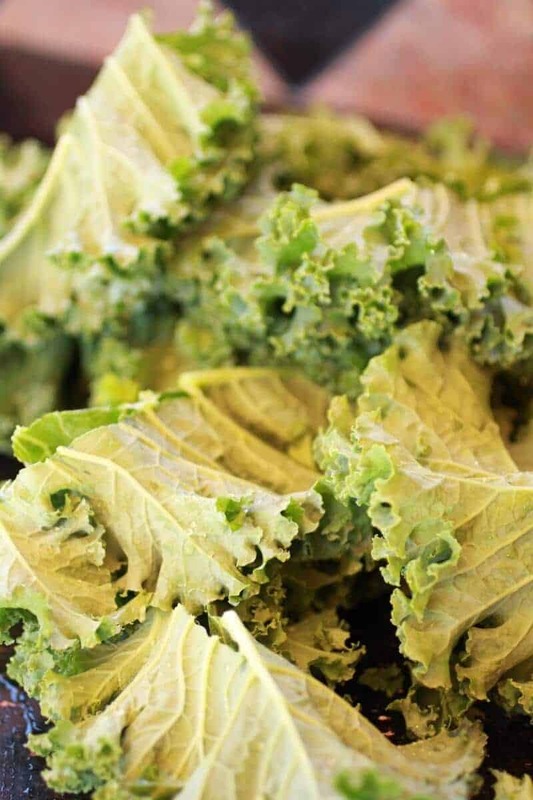 Raw kale > Crispy kale! I know, that never happens around here. It’s mostly chocolate, chicken, pasta, cheese, pizza and more chocolate. Ah, that sounds way worse than it actually is. Really I promise. We totally eat our vegetables (no, really we do!). You know what the best part about this salad is? 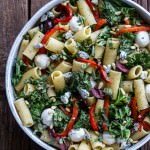 Apart from it being crunchy, chewy and cheesy in all the right places, it is easy. Quick and easy. You can even skip the whole grilling process if you have some leftover chicken lying around and I mean really who does not have leftover chicken sitting in their fridge right now? It can’t be just me. See lately……I have been so tired! Like I am honestly holding my eye lids open as I write this post. I know, glamorous isn’t it? Going to bed way too late and waking up WAY too early. NOT a good combo. I have been spending so much time on my photos. Trying to improve them, reading about light (OMG, help! The light is always changing. Sometimes my photos are way too bright or way too dark) and other things. All you photography buffs out there, I envy you, I just don’t understand all this stuff! I love it, but I hate it at the same time. Pretty photos are awesome. Hours of experiments/ pulling my hair out, not so much. So needless to say I needed a quick meal. A quick, healthy and delicious meal. The crispy kale is so good, you’ll be lucky if there is any left by the time you are ready to toss it with the rest of the salad. 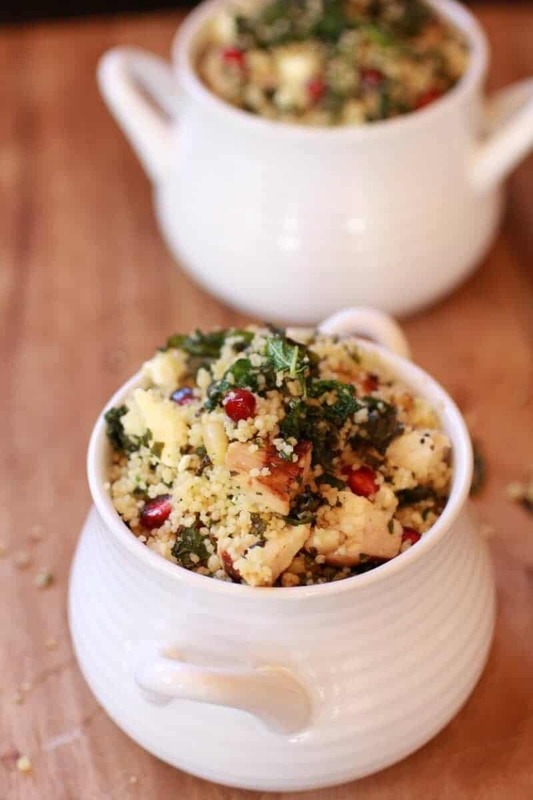 The couscous is fun and pairs really well with the kale. The pomegranates, those I am just addicted to. You know what the best part about this salad is? Apart from it being crunchy, chewy and cheesy in all the right places, it is easy. Quick and easy. Preheat grill to medium-high heat. Rub the chicken with olive oil salt and pepper. Grill for 7-8 minutes on both sides or until cooked through. Let cool five minutes and then dice into bite size pieces. Set a side and keep warm. While the chicken cooks start on the kale. In a glass measuring cup or small bowl, mix all the dressing ingredients, whisk to combine and then season with salt and pepper. Taste and if needed add more salt and pepper. Grease a baking sheet and spread kale on the baking sheet. 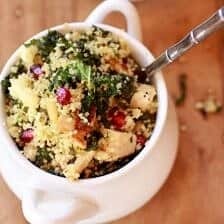 To the kale add 2-3 tablespoon of the dressing (just enough to coat the kale, reserve the rest) massage the kale with the dressing and spread out evenly on the baking sheet.and roast for 10 minutes. Toss well and roast for 5-10 minutes more, until slightly crispy but not golden. While kale is roasting bring the water to a boil. Once the water boils, remove from the heat and add the coucous, stir and cover for 10 minutes or until ready to use. When ready to use fluff with a fork. 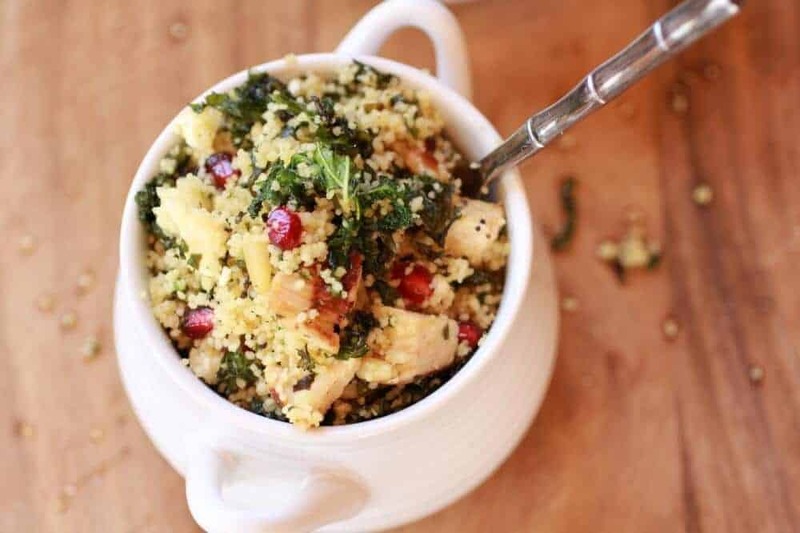 Once the chicken, kale, and couscous are all done combine them in a large bowl. Add the toasted pine nuts, pomegranate seeds, avocado and goat cheese. Toss to combine and then add the remaining dressing and toss one more time. So, I think I need to go to sleep now! 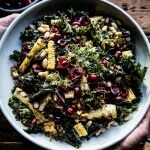 Sunflower Seed, Kale and Cherry Salad with Savory Granola. ahhhh FINALLY a recipe that is healthy, that i can cook and like to eat. Thank you soooooooooooo much for sharing this at the party at http://www.fineCraftGuild.com. I might just have to feature you! You are soooooo welcome!!!! And if you have to feature this delicious salad, I totally understand! Hi Tieghan ! I saw you linked up at the Grow Your Blog link party. It looks like you have tons of recipes I’ll have to check out!! Plus, I love quinoa and kale! I am now following you on facebook and I invite you to follow me back! Thanks for following me! I am coming to check out your site now! This looks delicious! I’m allergic to pine nuts. Can they be omitted? Also, if I can’t find pomegranate seeds, can cranberries be substituted? The pine nuts can can be left out, I would add toasted almonds or pecans. And yes, dried cranberries would be great! this looks so incredibly good. will definitely try it for our next girls’ get together! 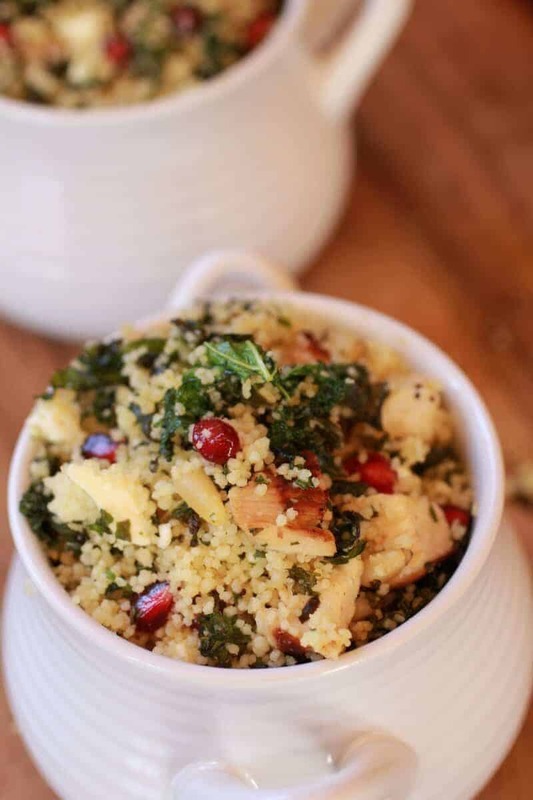 I love the combination of ingredients in this salad… the pomegranate seeds sound really interesting. Pinning this. Thans so much for pinning! I am soooooo with you on the photography challenges! … light is my blogging nemesis. LOVE the ingredients in this chicken salad (oh, and I love kale). Pinning. Thanks so much for sharing! Urg, the light, it is so frustrating! Thanks so much for reading and pinning! This sounds great! Thanks for sharing on Foodie Friends Friday! 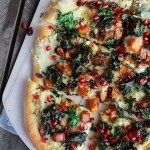 What a great way to use kale! 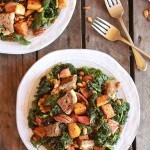 I absolutely love it prepared in any way (and all the vitamins in kale are just a bonus! Ha!) This looks so good, thanks for sharing! 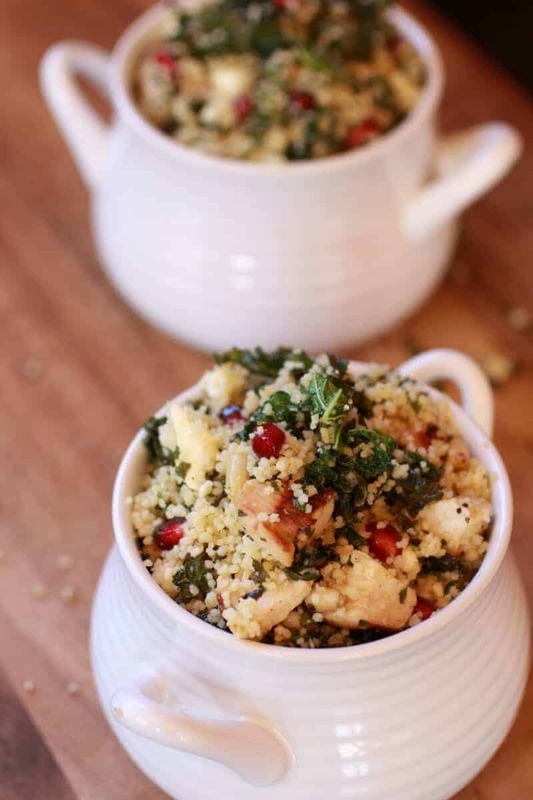 I’ll have to give the couscous a try! 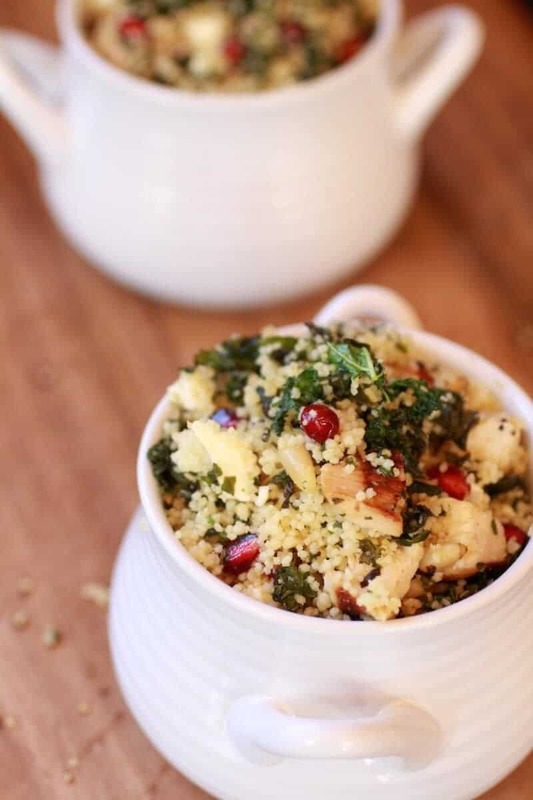 Love the idea of the pomegranate seeds for little hit of sweet and crunchy too. This really has it all! I found you by way of Jam Hands – thanks for sharing! 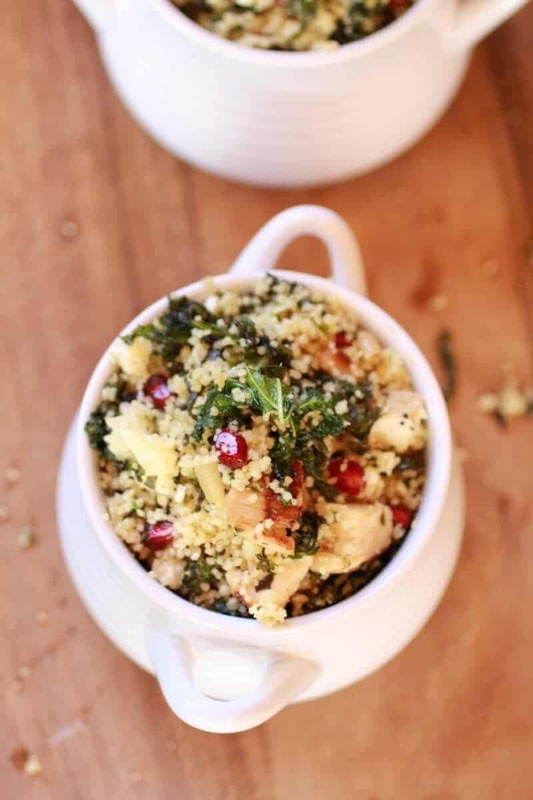 I’m crazy about kale, couscous and goat cheese so how can this not be a winner. Tomorrow’s farmers market day and I hope there is kale cause this will be on the table tomorrow night. YA! Let me know how it turns out! Could you suggest a substitute for the tahini? I can not say for sure, but I think almond butter butter might work. You want something with neutral taste. You can also just leave it out since it is only a tablespoon. I would add about a tablespoon more of olive oil though.The dressing just will not be a creamy. Hope this works for you! Another beautiful recipe! Pinning this one too! Just wanted you to know that your recipe is being featured to today on foodie friday. Will be pinning and tweeting it this week too. Thanks again for being part of our party. I am going to pin this! Thanks for sharing looks delicious! I just tried this last night and wanted to leave a comment to say how delicious it was! I didn’t have tahini but made no difference – very refreshing for a spring dinner. Thanks so much for this recipe! YA!! I am so happy you love this Sonja! Thanks for giving the recipe a try! Wonderful and easy recipe. The blending of these ingredients is a mouthful of delicious craziness…in a great way. You rock!! YES! Thanks Beth!! So happy you loved this!